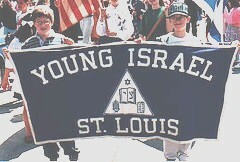 Young Israel of St. Louis is an Orthodox synagogue affiliated with the National Council of Young Israel that provides religious services and Torah study for its members. Its Women's Division organizes a variety of social and learning activities and is involved in many charitable causes. Guest speakers, classes in a wide range of Jewish subjects and lecture series are open to the entire community. The synagogue has an active chesed committee, which helps people who require any assistance. Our 160 member families have actively led and participated in many Jewish communal and educational institutions including the Jewish Federation, the JCC, the Jewish Center for the Aged, the Vaad Hoeir, Covenant House, St. Louis Hillel at Washington University, Torah Mitzion Kollel, Block Yeshiva High School and the Epstein Hebrew Academy. Two of its members have been president of the Jewish Federation of Saint Louis. The Community Initiative to Strengthen Families brings speakers and organizes programs to promote shalom bayis/bayit. The State of Israel figures proudly in synagogue programs, run in conjunction with the Kollel Torah MiTzion. Activities for Young Israel youth include Shabbos/Shabbat groups for children, a teen minyan, an innovative Bas/Bat Mitzvah program, Sunday morning Derech Eretz clubs and the city-wide Junior and Senior NCSY. Rabbi Shulman is a graduate of the Sha'alvim Rabbinic Kollel with Rabbinic Ordination from the Jerusalem Chief Rabbinate, and a graduate of Sha'alvim's Sha'al Institute for Rabbinic and Educational Training. He is an erudite and dynamic speaker with special interests in Judaism and Science, Medicine and Halacha, and Tanach, and has a deep and passionate love for Israel. He served as the spiritual leader of Congregation House of Jacob-Mikveh Israel in Calgary for five years and of Shaarei Shomayim Congregation in Toronto for ten years before coming to St. Louis. He holds a Teacher's Degree from the Sha'alvim Teacher's College and a B.Sc. in Computer Software Engineering from the Jerusalem College of Technology. He is also certified as a Rabbinic advisor to the organ donor community by the New York Organ Donation Network and the Halachic Organ Donation Society. Rabbi Shulman is a certified mohel and trained under the renowned mohel of Jerusalem's Bikur Cholim, Misgav Ladach and Hadassah hospitals, Yosef Halpern, of blessed memory, as well as the Chief Rabbi of Jerusalem, Rav Yitzchak Kulitz. Rabbi Shulman grew up in New York and Los Angeles. His wife Baila comes from Sydney Australia. They have six children, Zipporah, Hadassah, Shmuel, Avital, Yechiel, and Galit. They joined the Young Israel family in August, 2007. Jews have been in St. Louis since 1807, when merchant Joseph Philipson from Pennsylvania arrived in the territory and established a general merchandising store. The first religious services were held in 1836 when ten men rented a little room over Max's Grocery and Restaurant, on the corner now occupied by the St. Louis Arch Grounds. Now, 60,000 Jews live in St Louis, the largest city in the state of Missouri.